The following information details what is required for your opportunity to participate in the annual commencement exercise. These items are available in package deals from Herff Jones and can ONLY be ordered via their website link below. All payment methods are accepted and any questions related to ordering of regalia may be directed to Herff Jones at 702-396-4723 or 801-487-3305 or secretary@hjgrad.com. Faculty and students please order regalia via the Herff Jones website. STUDENTS THAT DID NOT RETURN THEIR REGALIA TO HERFF JONES AFTER THE CEREMONY MUST CONTACT THEM DIRECTLY AT THE NUMBERS OR EMAIL ABOVE AND MAKE ARRANGEMENTS TO DROP OFF AT THEIR LOCATION TO PREVENT FROM BEING CHARGED. REGALIA WILL NOT BE COLLECTED AT EITHER CAMPUS. The gown is black with the Roseman University shield on the left yolk. Rental gowns must be returned following commencement. A sure fitted black mortar board cap. Cap is retained by graduate. A degree-color tassel with year date. Color represents the degree earned, and tassel is retained by graduate. A silk stole representing the degree earned. Color shade represents the degree earned, and stole is retained by graduate. The gown is black with the Roseman University shield on the left yolk. Sleeves are extended (a “crest”). A master’s hood with the Roseman colors in satin. The outside velvet represents the color of your degree earned. The gown is black with two frontal velvet panels, and the Roseman University shield on both the right and left panels. Sleeves have three velvet bars representing doctoral protocol. Velvet panels and bars represented by degree color. A doctoral hood with the Roseman colors in satin. The outside velvet represents the color of your degree earned. A sure fitted black doctoral tam. Tam is retained by graduate. Graduates from the Bachelor of Science in Nursing program will wear a bachelor’s robe with a traditional sleeve opening. Graduates who are only graduating from the MBA program will wear a traditional master’s gown with an oblong tail extending at the back of the sleeves. Graduates from the Doctor of Pharmacy, Doctor of Dental Medicine and AEODO/MBA programs will wear a doctoral gown, which includes three velvet bars on the sleeve and two velvet panels on the front. The mortar board cap should be worn with the elastic on the back side, and the mortar board should be mostly level on top of your head. The doctoral tam should also be worn level on your head. Caps and tams should not be worn on the crown of your head or back of your head. Graduates are not permitted to have any adornments on caps or tams, including but not limited to tape, writing, or other items. When students arrive for graduation, the tassel should be on the right side. You will be directed to move your tassel to the left side during the commencement ceremony. The stole is a garment worn around the neck that may have a symbolic color based on the degree that the graduate is receiving, or the institution’s colors. Each regalia package includes one Roseman stole, and you can purchase additional “Stoles of Gratitude” to give as a gift to friends, family members, and others who supported you throughout your degree. The hood is probably the most misunderstood (and improperly worn) item, but it is a very important part of your regalia because it identifies the degree earned and the institution awarding the degree. Here are some basics to ensure you wear the hood properly. The hood is not actually intended to be worn as a “hood” over your head. It is draped around the neck and down the back of your gown. The outer part of the hood, called the shell, is generally black and is intended to hold the hood together and give it shape. The lining of the hood is on the inside and will be maroon for Roseman University. It should be worn against your gown with a little bit of maroon showing where the hood drapes. The velvet trim on the edge of the shell indicates the degree earned—for the College of Dental Medicine graduates it will be lilac, for PharmD graduates it will be olive green, and for the AEODO/MBA and MBA graduates it will be drab (light brown). Some hoods may also include a button or cord in the back that is designed to hold the hood in place and allow for it to show the appropriate amount of velvet trim and school colors (see common mistakes below for more details). An additional button or cord at the front is designed to hold the hood in place on the gown, away from the neck. Wearing the hood upside down (so the end that should be draped around the neck is down your back). Improperly draping the hood so only black and the velvet trim are showing, with no maroon visible. The velvet trim should be turned outward at a point just below the shoulders (at the spot where there is a button or cord, if applicable), so the satin maroon lining is visible. Improperly draping the hood so there is too much maroon showing and very little velvet trim visible. Wearing the hood like a sash, draped around your shoulders or arms. The front of the hood should be around your neck, and lay flat as it goes over your shoulders. MBA graduates will process-in to the commencement ceremonies wearing the MBA hood. PharmD/MBA graduates will process-in to the commencement ceremonies wearing the MBA hood, the same as other MBA graduates. Once at your seat, take off the MBA hood, fold it and leave it on your seat as you proceed to the stage for the PharmD hooding. PharmD graduates will proceed into the venue with the hood on the left arm. PharmD graduates will walk up to the stage with the doctoral hood on the left arm. 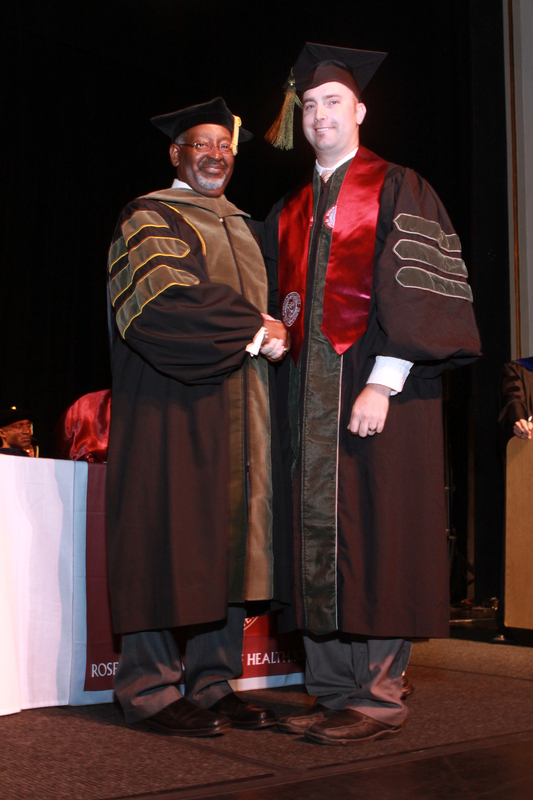 PharmD graduates will offer their hood to the faculty member(s)/administrator(s) designated to hood graduates. After being hooded, the graduate will walk across the stage. Candidates graduating with a combined DMD/MBA can only wear one hood at a time. DMD/MBA graduates will process-in to the commencement ceremonies wearing the MBA hood with the Dental hood on their left arm. Once at your seat, take off the MBA hood and put on DMD hood. You will continue to wear the DMD hood during the rest of commencement. At the end of commencement, please drape the MBA hood over your arm and process-out wearing the DMD hood. DMD graduates will proceed into the venue wearing the DMD hood. The graduate will walk across the stage. The only items permitted as a part of the graduation required regalia are those issued and/or approved by Roseman University of Health Sciences. Roseman allows a Commencement participant to wear a cord(s) issued by a student organization recognized by the University when that cord honors the graduate’s membership, leadership and/or contributions to that student organization. Graduates are only allowed to wear one stole – the stole recognized by the University that represents the graduate’s degree. No adornments to the graduation required regalia, are permitted. Examples of adornments include, but are not limited to, words, symbols, decoration, leis or other necklaces worn outside the required regalia (gown, cap and/or stole), corsages, and boutonnieres.